Sri Lanka Tourism to drive the lucrative South Korean Market which is worth 14 million Travellers with a per capita income of $25,000 met up with the top hierarchy of Korea Air in Seoul- South Korea, on the side lines of the Korean World Travel Fair-KOTFA to agree, the strategy to partner joint promotions between Sri Lanka Tourism and Korea Airlines which can be beneficial to both parties said a communique from Sri Lanka Tourism Promotions Bureau. 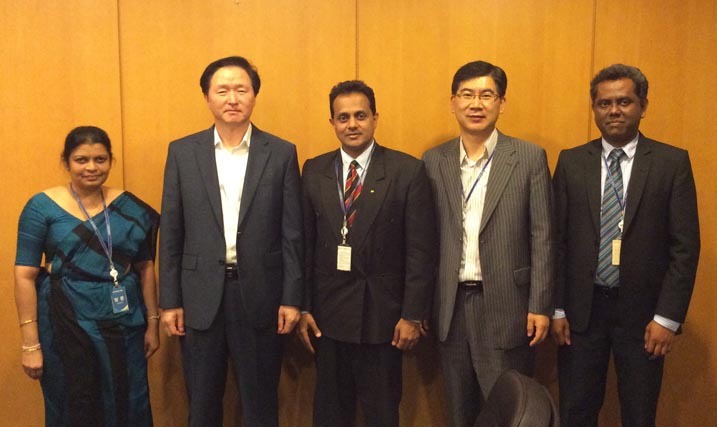 Madhubani Perera- Director Marketing SLTPB, Keehong Woo- Senior Vice President Korea Air, Dr. Rohantha Athukorala- Chairman Sri Lanka Tourism, Milton Song - Vice President Korea Air and Jagath Kumara Counsellor(Commercial) Sri Lankan Embassy in Korea. Sri Lanka currently attracts 13,000 visitors from South Korea and we want to double this volume within a year and hence the partnership with Korea Air that operates three flights a week to Colombo will be a key strategy said Chairman Sri Lanka Tourism Promotions Bureau Rohantha Athukorala. The Senior Vice President Passenger Business Division Mr. Keelong Woo, commented that it was opportune given that he was instrumental in originating the Colombo flight way back in 2012 and the business needs to be picked up for sustainability even though Maldives is a key market for South Korean honeymoon Travellers he said. We must spread our risk given that five destinations account for fifty percent of our tourism receipts which means we must look for new destinations outside these five countries. South Korea that has a 14 Million outbound market is a clear target said Athukorala. The good news is that the private sector support is very strong hence we must tie up with Korea Airlines who understands the Korean traveller better than us and together make this destination a 100,000 business in the years to come. The Sri Lanka delegation included Mr.Jagath Kumara Counsellor(Commercial) at Sri Lankan Embassy in South Korea and Director Marketing of Sri Lanka Tourism Ms. Madubani Perera.